The One Pro is a somewhat refined version of the UMIDIGI One that adds pros like NFC (for cashless mobile payments) and 15W wireless charging to its sibling's mix of specs. It also comes with double the storage memory, at 64GB, with support for up to 256GB's worth of external space tagging along. Sadly, it's not without some cons, one of which is its 3250mAh-only battery power -- a disappointing drop from the One's 3550mAh capacity, not to mention a setback that kills its chances of joining Phonerated's list of the best big-battery smartphones. 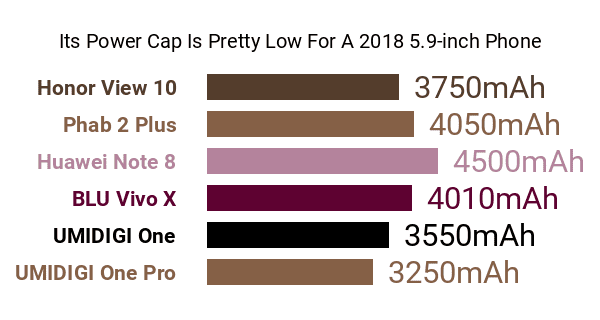 Aside from those key differences, the One Pro retains most of its little brother's pros and cons, including the expansive , yet low-resolution , 5.9-inch 19:9 In-Cell 1520 x 720 HD+ display. It is also offered in the same relatively-rare (as of this technical review) color options , namely, Carbon Fiber and Twilight. Its under-the-hood components still include MediaTek's middle-class Helio P23 two-cluster eight-core engine, which consists of a 2GHz quad-core performance cluster and a 1.5GHz quad-core efficiency cluster -- some of the best octa-core phones on the market use chips that run at roughly 2.5GHz. Also on board are a tolerable 4GB RAM and a 700MHz ARM Mali G71 MP2 graphics processor. As for its imaging pros and cons, the One Pro banks on a 12- plus 5-megapixel dual rear camera aided by a dual-LED flash, while a 16-megapixel 5-element-lens S5K3P3-sensor selfie camera sits on its display notch. Its other features include a side-mounted fingerprint scanner as well as a facial recognition system for security. The One Pro is equipped with dual nano SIM card slots coupled with dual VoLTE (Voice over LTE networks) support and it blasts audio through two stereo speakers. Tying everything together is the Android 8.1 Oreo operating system. All said, UMIDIGI's 2018 One Pro caters to large-screen smartphone shoppers who don't mind dealing with middle-class hardware if it meant relatively promising cameras.